Lighting is the use of light for aesthetic or practical effects. There’s the need for adequate lighting all around us. Lighting can be from natural or artificial light sources. However, during most hours of the day, daylight is used to illuminate buildings. The electrical technician would carry out an inspection or survey on the home or property to determine its complete lighting needs. This includes the exterior and interior lighting requirements, energy saving needs, aesthetic needs, practical lighting requirements, security lighting, and much more. After carrying out a survey on the property, the electrician would inform you on what is best for your lighting installations. From the audit, the electrical technician can determine what works best for your home and give you enough details to make informed decisions. Following the consultation and your decisions, the lighting installation project will begin. A professional electrician would acquire the needed tools and materials to complete the installation process in a suitable time. Regardless of if your home is small or large, the procedure remains the same from auditing to installation. However, every home or buildings has its unique and specific lighting needs. Which is why an initial audit is necessary. Lighting is valuable to buildings, homes, workplaces, and so on. Its benefits can only be experienced when lighting installation is carried out by a licensed electrician. Here are some benefits and the importance of good lighting. Studies have shown that light can affect people in several ways. The most common effect is an increase in productivity. Workers can be greatly inspired, motivated, and encouraged by a well-designed lighting system in the workplace. A properly installed lighting system adds value to a home or building. It makes it appealing to potential investors and even regular home visitors. Lighting facilitates organization and beauty in any space. Well-lighted businesses experience more traffic than others because light increases desirability. Lighting plays a major role in the security and safety of any building. A well-lighted environment helps to deter intruders and give you a clear view of your surroundings. 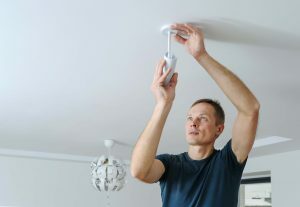 It can also contribute to alarm systems and other safety mechanisms in the home. With the right electrical technician, lighting installation can help to save energy cost rather than increase it. Lighting can be customized or installed to increase efficiency in the home or workplace while saving you from more bills. You can get a complete and proper lighting installation service from a reputable electrical company or professional electrician. At The Electric Connection we can provide lighting installation services for any building. Contact us to get started and give you satisfaction.